I use honey in tea drinks more often in coffee drinks, but honey is a sweetener that works just as well with coffee. Honey has a wonderfully subtle flavor to it and has lovely floral and vegetable notes that are often complimented by the flavors of tea. In a coffee drink, although it is brewed more strongly than tea, the honey still brings its unique flavor and sweetness to a finished beverage. I find that adding some milk to the coffee helps to soften it and allow the honey to come through even more and that is what inspired this Honey Vanilla Latte. This Honey Vanilla Latte is flavored with both honey and some vanilla simple syrup, a mixture of equal parts sugar and water. I found that adding a touch of extra sweetness in the form of simple syrup helped to highlight the honey and allowed me to sweeten the drink a bit more effectively than I could with honey alone. The latte is creamy and the sweetness of the honey is fantastic with the natural sweetness of the milk. While the drink is on the sweeter side, it’s not overwhelming and you can still taste the natural sweetness of the steamed milk alongside the honey. 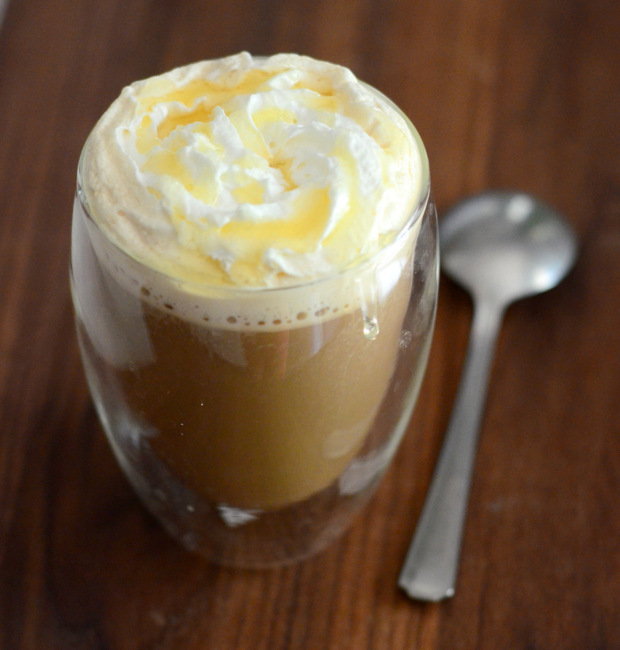 As we head towards spring, this is one of my favorite seasonal lattes. It’s just sweet enough, with a hint of that floral flavor (especially if you use a good clover honey) that makes honey so wonderful in the first place, and really evokes the changing of the seasons. Plus, it’s delicious. I topped mine with whipped cream and a drizzle of honey, but free free to stick with steamed milk, if you prefer. The recipe below gives two options for making this drink, one with espresso (Nespresso is also a good choice) and one with strong, brewed coffee. Take your pick depending on what kind of coffee you brew at home. The same goes for the milk, which can simply be heated or it can be steamed with either an espresso machine or a countertop milk frother. Combine honey, vanilla syrup and espresso in a mug. Whisk to combine. Top with steamed milk and serve. Whipped cream toppign is optional. If using coffee, simply substitute coffee for espresso and follow the remaining instructions. In a microwave-safe measuring cup or bowl, combine sugar and water and heat until water is hot enough to dissolve the sugar. Stir in vanilla extract and allow mixture to cool. Simple syrup can be kept, covered, in the refrigerator for up to 2 weeks.